Ideal for spare parts or matching an existing PT8000 weigh system as this model is no longer being produced. Limited capacities and quantities available. We recommend the LCBB for new installations. 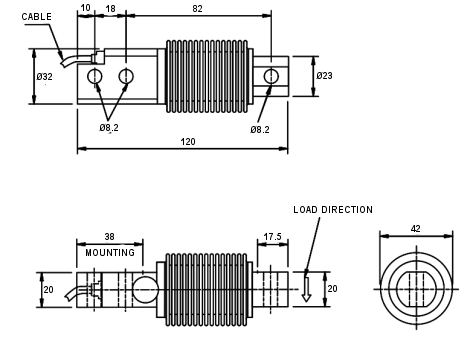 The PT8000 is a stainless steel bending beam load cell with welded construction sealed to IP68. Uniquely designed, the sensor allows for superior bellows operation through its full measurement cycle, providing longlife protection and accuracy. Ideal for harsh environments and high wash down areas, PT8000 is widely used in food and marine industries. Common installations include belt weighing as well as weighing and packaging machines. The industry standard size and shape allows for replacing many bending beam models. It has less than 0.4mm deflection at full load, a safe loading of 150% and an ultimate load of 300%. In addition to its compact footprint (typical across all eight capacities), PT8000 has a great range of mounting accessories to optimise performance and extend the life of the load cell.